Have you ever realised you are obsessed with diets and weight loss? To the point where you wish you could just "Lighten up"? Often, if you can accept that you don't want to live on cabbage soup but rather lead a healthy, balanced life with occasional treats, then this is the book for you! The author has shared stories of old which will pull at your heart. She also has written hilariously funny descriptions of who looks back at her from the mirror. Realising if she were to just 'lighten up' she might well in fact literally lighten up, Louise discovered a whole new life. Opening her up to a new pathway to help others into a healthier life, she also realised a new business. 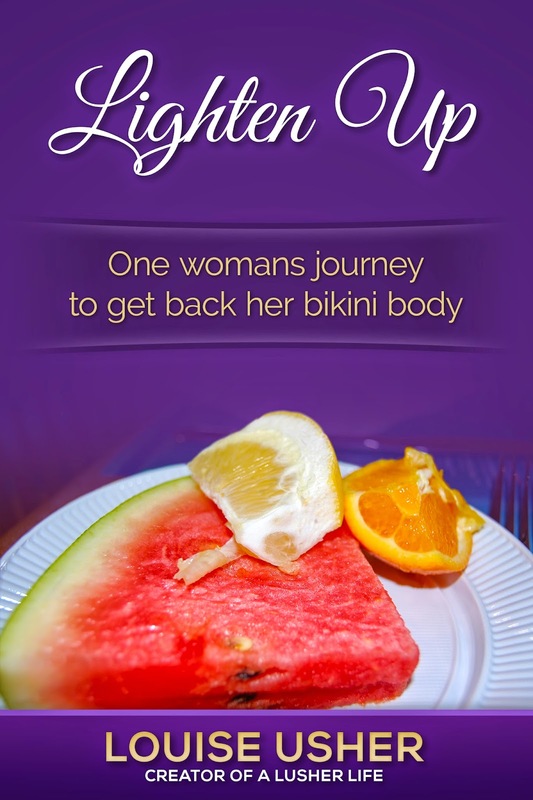 Follow her journey from frustration to bikini wearing beach goer in this easy to read journal. Tips, tricks and even links will inspire you to lighten up too! Louise Usher is a passionate nutritional therapist. With a deep love for passing on her messages and knowledge through the comfort of a loving and positive mindset. She has been helping others for years to realise that they will realise the power is within their own hands. Creating the brand A Lusher Life, you can find Louise all over the internet. She is now opening up to train others to help people with her business. You can find out all about it within this hilarious journal. If you know me well enough, and I think you do after reading here for all this time, you will know most of the above. What you might not know, unless you watch the video is this: I have now got onboard with Forever Living as a consultant. So now, not only can you come to me for guidance on health and nutrition but I can also recommend some amazing products for you. I know these are amazing as I have used them and tried them! Guess what? I documented it all for this blog and also in video form for my Youtube channel. These videos will be released next week. IT's very very exciting. So, the book is really there as a little addition to this blog although you will get the daily updates posted on here. However, to get the extra bits and get it all in one, you can either buy it for $0.99 on Amazon or you can sign up to my email list (on the left there) to get it for free to your inbox! Many of you will have already heard of Forever Living and I'm super excited to share everything with you that I have found. Truly, the products are of great quality and they helped me to lose 7 lbs in 9 days with a detox plan called Clean 9. Now, don't worry, I will still be sharing my life ramblings here too and taking you on my journey, yet at the same time, I will be sharing even more amazing recipes and letting you know about health and nutrition at the same time. So watch this space for awesome experiences. Should you decide you also would like to be part of my business and get some free business coaching too, let me know! Watch this video to see what you could be in for with some determination and hard work! Free juicing DVD to watch this weekend!